Headlies: Sack Of Flour Jumps Ship And Joins WWE - WrestleCrap - The Very Worst of Pro Wrestling! Pittsburgh, PA – In a stunning move harkening back to the cutthroat days of the “Monday Night Wars”, TNA’s most popular Knockout Sack Of Flour has left the company to join WWE. Vince McMahon was said to be furious at the news leaking early, ruining Sack Of Flour’s surprise entrance into the Royal Rumble. McMahon dressed-down several members of the writing team and reportedly dangled The Miz out of a window. The window-dangling incident was apparently unrelated as it is part of McMahon’s weekly routine. While the surprise may have been spoiled, interest in the Royal Rumble is at an all-time high. Betting lines in Las Vegas have swung wildly and WWE officials are expecting a buy rate that may rival Wrestlemania 28. Plans for Sack of Flour beyond Royal Rumble remain sketchy, but it is believed she will challenge AJ Lee for the Divas belt at Wrestlemania. The match will be built upon the real-life feud between the two as Lee’s real-life boyfriend, CM Punk, has been seen with Sack Of Flour at a Chicago Blackhawks game. 25 Responses to "Headlies: Sack Of Flour Jumps Ship And Joins WWE"
I wonder if Sack of Flour will be on season 2 of Total Divas? Just as long as she learns that the Bellas are “veterans” and don’t try to upstage them in any way. Well at least it was a sack of flour and not a sack of sh…………..
That’s “The World Most Dangerous Shakes” surely? Sack of Flour probably won’t win, but I guarantee it gets to the final four. 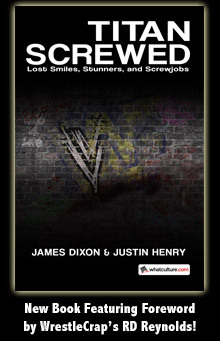 Well it looks like AJ Lee will have to wait at least another year to win the Slammy for best Diva. Poor girl can’t catch a break. What do we call fans of the Sack of Flour? Sackies? Sack of Flour’s expected to have a few decent matches, then spend the rest of her year-long contract floundering about while Vince and company hyperfocus on The Bellas some more. But seriously, going back to the days of WWF No Mercy for the N64, who wouldn’t want a six-foot tall sack of flour as DLC for WWE 2K14? It would make Universe mode entertaining, tonight on Super RAW, John Cena vs. Randy Orton vs. a Sack of Flour. That’s a five star (video game) classic in the making right there. 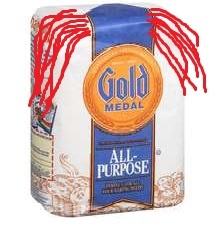 Does Sack of Flour even know how to work WWE Style? That’s what the Perflourmance Center is for! WWE has to learn Sack of Flour’s style. Meanwhile prankster Randy Orton was seen wolfing down a tray of enchiladas to prepare himself for his special initiation to the WWE newcomer. Betting odds on who sleeps with Sack of Flour first, C.M. Punk or Batista? Punk and Sack of Flour can hook up and form the Straight Edge Baking Society. The murchandize alone has a Phillip J. Fry “SHUT UP AND TAKE MY MONEY!” potential to it. Too bad they change Sack of Flour’s name to Powder Bag for the NXT debut.